Here we dive a bit deeper in advanced flow control in Noodles. Starting with a recap into for-loops, moving on to conditional evaluation of workflows and standard algorithms. This chapter will also go a bit deeper into the teritory of functional programming. 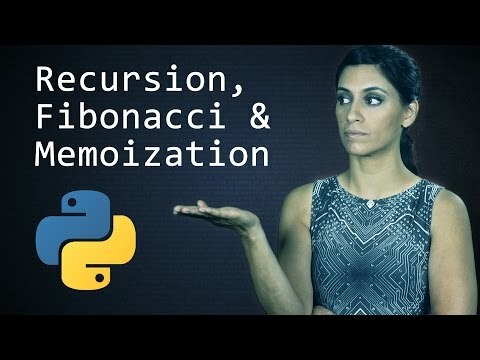 Specifically, we will see how to program sequential loops using only functions and recursion. This last version can be translated to Noodles. Assume for some reason we want to schedule the reverse_word function (it takes forever to run on a single core!). Because reverse_words becomes a promise, the line with ' '.join(reverse) also has to be captured in a scheduled function. This example shows how we can do loops in parallel. There are cases where we will need to do loops in a serialised manner. For example, if we are handling a very large data set and all of the computation does not fit in memory when done in parallel. There are hybrid divide and conquer approaches that can be implemented in Noodles. We then chunk all the work in blocks that can be executed in parallel, and stop when the first chunk gives us reason to. Divide-and-conquer can be implemented using a combination of the two looping strategies (parallel and sequential). Sequential loops are made using recursion techniques. 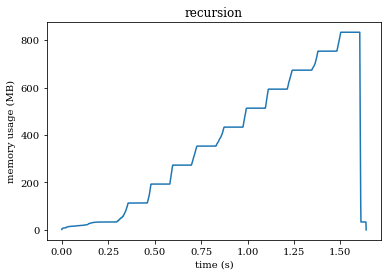 There is a problem with such a recursive algorithm when numbers get too high. Yikes! Let’s head on. And translate the program to Noodles. Suppose we make factorial a scheduled function, we cannot multiply a promise with a number just like that (at least not in the current version of Noodles). We change the function slightly with a second argument that keeps count. This also makes the factorial function tail-recursive. Yeah! Noodles runs the tail-recursive function iteratively! This is actually very important. We’ll do a little experiment. Start your system monitor (plotting a graph of your memory usage) and run the following snippets. We let every function call to factorial gobble up some memory and to be able to measure the effect of that we insert a small sleep. Fair warning: With the current setting of gobble_size and running 50 loops, the first version will take about 4GB of memory. Just change the size so that a measurable fraction of your RAM is taken up by the process and you can see the result. Try to understand why this happens. We have reserved a NumPy array with gobble_size (\(10^7\)) floating points of 8 bytes each. The total size in bytes of this array is \(8 \times 10^7\ MB\). In each recursive call to factorial the array is copied, so in total this will use \(10 \cdot 8 \times 10^7\ MB = 800\ MB\) of memory! 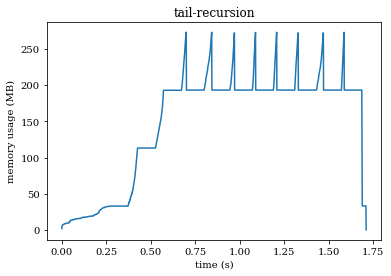 The next version is tail-recursive. This should barely make a dent in your memory usage! Now, the factorial function is still recursive. However, since returning a call to the factorial function is last thing we do, the intermediate results can be safely thrown away. We’ll have in memory the original reference to gobble and one version in the Noodles run-time for the last time factorial returned a workflow where gobble.copy() was one of the arguments. In total this gives a memory consumption of \(160\ MB\) (plus a little extra for the Python run-time itself). We see peeks that reach over \(250\ MB\) in the graph: this is where gobble is being copied, after which the garbage collector deletes the old array. We’ve put the if-statement inside the scheduled function what_to_do. This returns a new workflow depending on the value of x. We can no longer get a nice single graph picture of the workflow, because the workflow doesn’t exist! (there is no spoon …) We can work through a small example from the Python tutorial: computing prime numbers. The core computation in this example is the n % x == 0 bit. So we start by creating a scheduled function that does that. Noodles can parallelize the inner loop, but this gives a problem: how do we know when to stop? There is no way to get it both ways. First, we’ll see how to do the parallel solution. We’ll compute the divides(n, x) function for the values of n and x and then filter out those where divides gave False. This last step is done using the compress function. Using the compress function we can write the Noodlified parallel version of the filter function. We’ll call it p_filter for parallel filter. is true. If function is None, return the items that are true. Using the generic p_filter function we then write the function find_factors that finds all integer factors of a number in parallel. Both p_filter and find_factors won’t be scheduled functions. Rather, together they build the workflow that solves our problem. No we can run this workflow for all the numbers we like. Few! We managed, but if all we wanted to do is find primes, we did way too much work; we also found all factors of the numbers. We had to write some boiler plate code. Argh, this tutorial was supposed to be on flow control! We move on to the sequential version. Wait, I hear you think, we were using Noodles to do things in parallel!?? Why make an effort to do sequential work? Well, we’ll need it to implement the divide-and-conquer strategy, among other things. Noodles is not only a framework for parallel programming, but it also works concurrent. In the context of a larger workflow we may still want to make decision steps on a sequential basis, while another component of the workflow is happily churning out numbers. However, if f is a scheduled function f(lst) will give a promise, and this routine will fail. That works. Now suppose the input list is somewhat harder to compute; every element is the result of a workflow.